Humans need a transport system in order to exchange substances with their environment. Our transport system is called the circulatory system and it can access all the cells in our body. - A circulatory fluid - the blood. - A set of tubes – the blood vessels. - A muscular pump – the heart. Cells in all organisms live immersed in a medium which gives them all the nutrients they need. They also excrete the waste products released during metabolism into this medium. In multicellular organisms like humans, this medium is called extracellular fluid. It contains interstitial fluid, a liquid found in the spaces between cells. This interstitial fluid is renewed by blood, which is constantly circulating around the body providing nutrients to cells and taking away waste products. The human body contains around 5 liters of blood. Blood is a viscous fluid which flows inside the vessels of the circulatory system. It consists of different kinds of blood cells suspended in a liquid called plasma. Red blood cells or erythrocytes are the most abundant. They contain the oxygen carrier molecule called haemoglobin, which gives blood its red colour. Red blood cells carry oxygen from the lungs to all cells of the body; additionally they carry carbon dioxide away from cells and to the lungs. They are disc shaped and have no nucleus ( in order to have more surface area to carry more oxygen). They are also small and flexible so can pass easily through blood vessels. Platelets or thrombocytes. These are cell fragments which contain substances that allow blood to coagulate preventing haemorrhages. They clump together forming a plug to help your blood clot. Task: a. 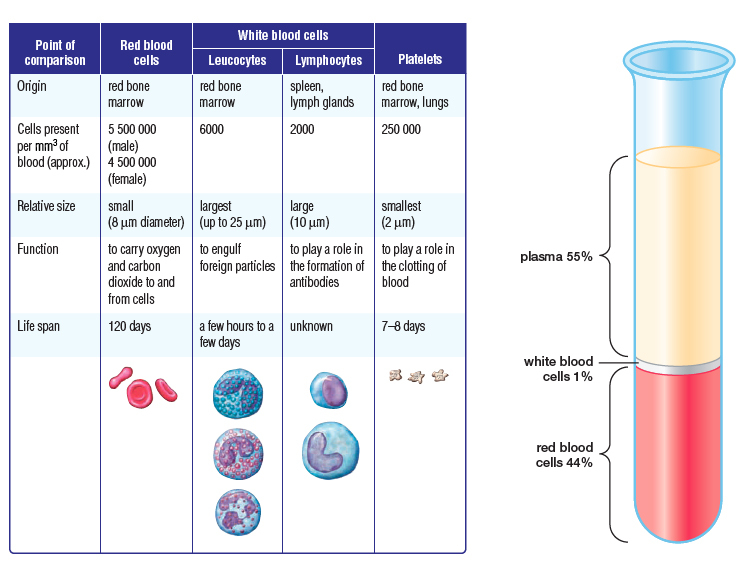 Create a table in your NSD that compares the three types of blood cells. b. Design an advertisement for plasma. Try to use its properties to make it sound like a product people want to buy. It transports nutrients and oxygen to all cells. It collects waste products released during cell metabolism. The main waste products are urea, uric acid and carbon dioxide. It transports hormones around the body, which play an essential role in controlling body functions. It helps regulate temperature. Blood works like a central heating system, moving body heat from the warmer areas of the body to the cooler ones. It plays an essential role in protecting our bodies from infections. It prevents blood loss when a blood vessel is broken through a series of mechanisms. Task: Create a mind-map to help you remember all the important roles blood fulfils. Capillaries: Capillaries are very narrow thin blood vessels which branch out from arteries (from the arterioles). Capillaries carry blood to and from the body’s cells. Capillaries are the site at which exchange of oxygen, carbon dioxide and nutrients takes place. The structure of capillaries makes them very well suited for this function. As capillaries are only one cell thick and have very thin permeable walls this means that substances can diffuse out of them very easily. (Fluid leaks out of the capillaries and bathes the surrounding cells, this is called tissue fluid. Useful substances such as oxygen and food diffuse out of the blood in the capillaries into the tissue fluid where it is then taken to the cells. Waste products such as carbon dioxide diffuse from the body’s cells, into the tissue fluid and are reabsorbed back into blood in the capillaries). Task: In your NSD, insert an image taken from a microscope that shows both human veins and arteries. Label the image with straight lines (not arrows) and underneath explain the differences. The heart is a pump that circulates blood all around the body. It is approximately the size of a human fist and is located just to the left of the centre of a human’s chest. On average it beats between 60-70 times a minute when you are at rest. The heart is a hollow organ made of a special type of muscle called the cardiac muscle. The heart is in fact a double pump. 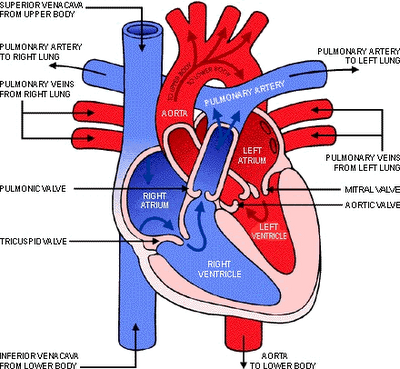 The right side of the heart is considered as one pump and the left side of the heart is the second pump. A thick wall called the septum separates the two sides. The right side of the heart carries deoxygenated blood to the lungs to be oxygenated. The left side of the heart pumps oxygenated blood to the rest of the body. ​Mammals have a four-chambered heart with two atria and two ventricles. The heart contracts and relaxes thanks to electrical impulses received from the Sinoatrial node, or pacemaker found in the heart. When the atria contract blood is pushed through the open valves into the ventricles. When the ventricles contract blood from the right ventricle is pumped through the pulmonary valves and onto the lungs, blood from the left ventricle is pumped through the aortic valves and onto the rest of the body. Both ventricles do not contract at precisely the same time, the left ventricle contracts slightly before the right. After contraction the ventricles relax, and wait for the next electric impulse. The atria fill with blood and an impulse from the pacemaker starts the cycle over again. Task: Imagine you are a red blood cell (RBC), and write a poem, story or rap about your journey through the heart, around the body and back to the heart. What would you see, hear, feel as you travelled through the ventricles, arteries, capillaries and veins? Blood enters the heart into the right atrium through the superior and inferior vena cava. The atrium contracts pushing the blood into the right ventricle as the tricuspid valve opens. The right ventricle contracts, the semilunar valve opens, and blood is pumped to the lungs via the pulmonary artery. Oxygen-rich blood from the lungs returns to the heart at the left atrium via the pulmonary vein. The atrium contracts and blood flows into the left ventricle as the bicuspid valve opens. Finally, the left ventricle contracts and blood is pumped through the aorta to the body tissues. Blood returns to the heart through the superior vena cava (deoxygenated blood from head, neck, and forelimbs) and inferior vena cava (deoxygenated blood from trunk and hind limbs). Task: Review the circulatory system with this link and revise using the questions after the animations. Humans have a double circulation system. Briefly explain what that means. Draw a heart and label its parts. Which valves prevent the blood from rushing back into the heart when ventricles relax? Do the lungs have muscles of their own? Where are blood cells produced? Write three key functions of blood. Which blood vessels carry blood away from the heart? As you know the heart is divided into two halves. Are these two halves connected? Explain how blood moves through both parts of the heart starting at vena cava and finishing at the aorta. Cabrera, C. A. M. (2011). Biology and geology, ESO 3: Oxford Clil. San Fernando de Henares: Oxford Educación.